Chelsea have been linked with a move for Paris Saint-Germain forward Edinson Cavani, while Cesc Fabregas is expected to make his last appearance for the club on Saturday. The Blues haven’t been particularly prolific in front of goal so far this season, bagging 38 goals in their 21 Premier League outings, which gives them the lowest tally of the top six sides. 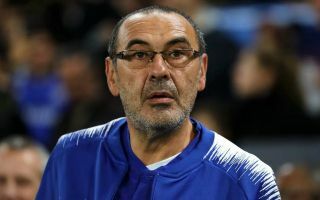 With neither Alvaro Morata nor Olivier Giroud offering a consistent source of goals, it is arguably going to continue to be a major problem for Maurizio Sarri moving forward, as a clinical forward up top is capable of taking the pressure off with a moment of magic to find a goal. In turn, in order to compete on multiple fronts and win trophies, Chelsea perhaps need something more in that department, and Calciomercato report that they may try and prise Cavani away from PSG, albeit Napoli are also said to be keen. Napoli fans know exactly what the Uruguayan international is capable of after he bagged an impressive 104 goals in 138 games during his previous stint with the club. After a successful spell with PSG, the 31-year-old has now taken his career tally up to 336 goals in 547 appearances, proving that he has been one of the most prolific forwards in Europe in recent years. Time will tell if Chelsea can secure a deal for him, but given his track record, experience and quality in the final third, he could be exactly what they need to bolster Sarri’s attacking options. Meanwhile, Sky Sports note that Fabregas is all set to play his last game for Chelsea in their FA Cup clash with Nottingham Forest at Stamford Bridge on Saturday. The Spanish stalwart is expected to complete a move to Monaco imminently as his current contract expires at the end of the season and so Chelsea appear to be cashing in while they still can, as noted in the report. While it leaves a void in the squad in the remaining months of this season, it promises to be an emotional afternoon for the 31-year-old if he does indeed say his goodbyes to the Chelsea faithful after the game.